When we first moved into our house, one thing I learned pretty quickly was that plyometric/high-impact just wasn't going to fly. As you might know, I've mostly been a home exerciser because I didn't have a gym membership for two years. We used to live in a carpeted apartment above someone who was rarely there, so we were able to do whatever we wanted without complaint. Suddenly, I was unable to jump without creaking the entire place, which I was certain was not a good thing. Also, talk about a lack of shock-absorption! 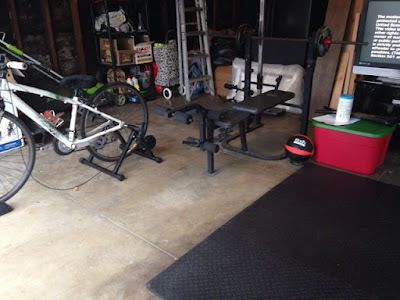 It took over two years for me to start a home gym outside of our living room. The impetus for this was not just having a baby but having a commute that eats up a lot of the old workout time I used to have. I didn't work out consistently until six months later when I finally joined a gym that is super close to work and resorted (still do) to quickie lunchtime workouts. Still, when I was working out more on the weekend or working from home, a home gym seemed like a better solution. "The Ukrainian" also has a gym membership, but is at his work (so no weekends/holidays) and sometimes it is just easier to have something here for when he can't make it. 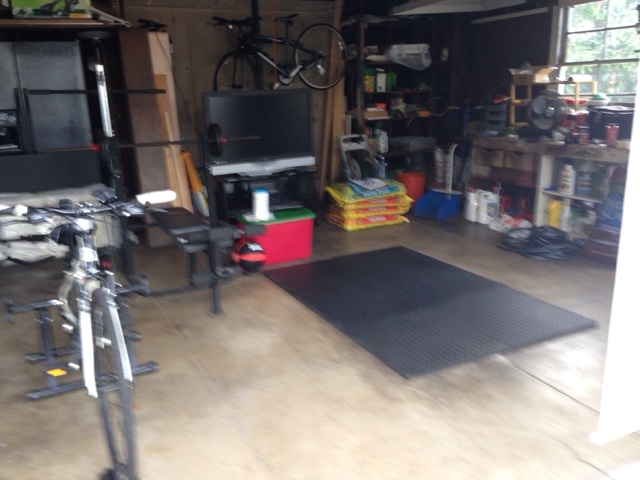 a mat that I had previously used indoors (from Sport Chalet); it doesn't slip on concrete! a large storage bin for all the miscellaneous stuff I have accumulated over the years -- resistance bands, kettlebells, jump ropes, etc. weight bench that was "The Ukrainian"'s when he was a teenager... still has some life left in it! ... and we've called it a day for now. We actually did this back in the summer... it's taken this long for me to write about it. Admittedly, I am not in here a lot these days, and I'm hoping that writing this post will inspire me to get back in there and maybe work on it more. I have been hanging onto the "exercise wagon" by a thread after I started feeling burnt out in September (just three months after I was really getting semi-serious about exercising again!). By this, I mean that I don't always get my 5 workouts a week in... which is no good if I'm usually only topping out at 30 minutes per workout. Work and low energy (sleep is still precarious around here) are my excuses... so although I used to utilize naptime for workouts, I finally just decided I'd actually nap during his naptimes just like all the "advice" says. So I stopped working out on the weekends altogether, using the "oh, I'll walk the baby to the park instead" or "I'll just do some Pilates while the baby is playing around me" excuse that doesn't always pan out. More to come. Please excuse the garage-ness (and blurriness) of this photo. As for future modifications, I know I have a random radio and old iPod speakers somewhere... so if I find it, maybe I can put on some music to get me motivated! I guess my phone would work, too. An elliptical trainer would be nice, but after going to some local stores, I decided to wait and see whether I can commit to a home gym before making that kind of upgrade. And who knows... maybe a home-made ballet barre?! Also, when the baby is older, maybe we can have a little sports center nearby, too??? The good news is that this "home gym" is there whenever I'm ready. Neat! I wish we had a little space somewhere for this type of thing so that I could spend less time at the gym!